Cyberspace Review | RPG Review Cooperative, Inc. There was a time in the late 1980s when there was quite a run on cyberpunk roleplaying games; Cyberpunk (1st edition and 20.20), and Shadowrun were, of course, the big names, and even Traveller 2300 (2300AD) decided to have a shot with the Earth/Cybertech supplement. From the ICE corner of the publishing market, came Cyberspace. It did strike as a little contrived and incongruous at the time. After all, ICE was known for their detail-heavy Rolemaster fantasy RPG, their Middle-Earth line, and a rather space operatic Spacemaster. Nevertheless, author Todd Foley (previously responsible for War on A Distant Moon and Beyond The Core for Spacemaster) stepped up to the task, with a stripped down version of the 'Master' system supplemented with cyberpunk setting and style. 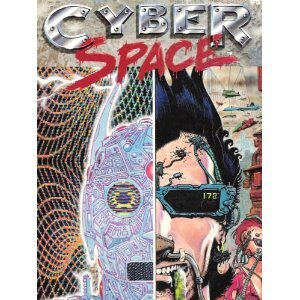 Cyberspace came in a 206 page softcover with cover art from Rick Veitch, representing a juxtaposition of the crowded, polluted cybernetic environment and the abstract neon of cyberspace. It shows some creativity, but the technique is very much comic-book style, which is the illustrator's area of work. The interior art, by Rick Lowry, Angela Bostick, Del Harris, and Karl Martin, is nearly all good, giving a good sense of the style of cyberpunk with some images reminiscent of scenes from books and films of the time. The text is mostly presented in three-column ragged-right with an somewhat annoying sans-serif font, made up however by very clear and common sub-section headings along with obvious chapters heading and numbers on each page. Despite the density of the text finding the relevant material during play was as easily acquired skill. After a short preface there are six chapters, The System, Running The World, Technology, Cyberspace, an Adventure and some very handy Appendices. These are supplemented by a good two-page table of contents and a somewhat short one page index. The writing style in the rules is mostly formal, to the point but supplemented with plenty of examples. There are thankfully short narratives introducing each chapter along with interesting occasional box-sections outlining annual events up to the year 2090, when the game is set. The preface provides a short, punchy, introduction to the setting, outline of the book, and game conventions (abbreviations, definitions, the d100 system and open-ended rolls, difficulty levels). After that it's straight into character generation with 11 stats (Constitution, Agility, Self-Discipline, Reasoning, Memory, Strength, Quickness, Empathy, Intuition, Presence and Appearance), each rolled on d100 and distributed according to the player's wishes. These values translate into "stat bonuses" (ranging from +25 to -25 at the normal extremes) which contribute to total skill bonuses; notably Appearance makes no difference in this regard. Players also choose their character's profession which come with the delightfully appropriate titles of Sleaze (social skills), Sneak (subterfuge), Killer (weapons), Net Junkie (cyberspace), Jockey (general) and Tech Rat (technical). The choice of profession provides a balanced additional bonus to skills based on profession level; for example a Sleaze gains +3/level to social skills, +1/level to general skills and +3/level to perception. After determining profession a random roll determines social class which varies according to profession. The social classes determine the number of starting languages, adolescent skills rank and starting money. Like the professions these are also evocative; Upper, Middle and Lower Corporate, Upper and Lower Sprawl, Resource and Refining Zone, Arcology, Wilds, Urban Homeless, Gypsy, and Space Colony. Skill ranks are also gained through a character's apprenticeship period and each level gain, with the number of ranks depending on the profession and skill category with specific skills chosen by the player. The optional character background options section includes randomly determined special skills, status, wealth, connections and idiosyncrasies. Injuries, handicaps from past experience, and ambidexterity are likewise randomly determined. Levels are gained through experience points, experience points are gained by successful maneuvers, constructions, combat actions, ideas, and travel. Skill ranks convert to skill bonuses with diminishing returns. These are added to stat bonuses plus any special background or equipment bonuses. The total is a bonus that is added to a d100 roll, with greater success achieved with higher totals. As mentioned skills themselves consist of a number of categories; Maneuvering, Weapons, General, Subterfuge, Social, Cyberspace, Technical, Special and a small collection of "non-adventuring" Secondary Skills. Specific rules exist for combat, static maneuvers, moving maneuvers, vehicular maneuvers, and construction and research. The combat system is resolved in ten second rounds with an open-ended d100 roll with offensive bonus added and defensive bonus subtracted. The result is then cross-referenced on a table according to weapon type and armour type and which determines whether any concussion hits or criticals have been scored. If a character is reduced to zero in the former the character is unconscious. The latter gives results according to the attack type for loss of life, limb, bleeding, shock etc. As these are much reduced from their Rolemaster/Spacemaster origins there is a degree of repetition in actual play. The substantial world chapter begins with an expected theme of multinational corporations increasing dominance with declining nation-state governments. Generic geographic regional overviews neatly correlated with the social status in character generation; corporate cities and suburbs, inner cities and sprawls, resource and refining zones, arcologies and aqualogies, wilderness reserves, wastelands, space colonies and the life of the homeless. Aspects of normal life are described in surprising detail (for RPGs, that is) including family, education, health care (including cloning), transportation, communications and home entertainment, careers and personal finance (including cost of living), law enforcement and privacy, and neologisms. Several major corporate entities are described with their primary operations, total assets, employees, branches, executives and major shareholders along with their cyberspace data. A collection of sample gang data is also provided for the San Francisco and Bay Area, the default setting for the game, which follow a simple but accurate format of leadership, size, identifies, and activities. Governments receive only a passing mention, perhaps the greatest thematic error of the genre (more likely, the state will act as the "ideal collective capitalist" to quote Friedrich Engels). Three arcologies and several orbital habitats also receive short descriptions. The chapter continues with several pages (a dozen in total) of "interesting and important" NPCs designated as hostiles, neutrals and patrons with game statistical information and character background before concluding with an overview of San Francisco, with an general overview, a description of the various districts, and almost sixty 'places of interest'. The opportunity is taken here to give to briefly describe the short adventure which makes up the penultimate chapter of the book, "Hot on the Heels of Love", involving a corporate headhunter who has fallen for a rather likeable woman who wanted to know more than she should about a certain corporation. Apparently lost to the corporations the PCs are hired out to find out what has happened. The scenario is a fairly straight-forward break-and-enter in many respects but contains a couple of appropriate plot-twists to introduce the PCs to the sort of world that they are dealing with. Taking up almost forty percent of the page count, the Technology and Cyberspace chapters are extensive with interest shown in powering of cybernetic devices and functionality from inputs, internals and outputs. Cybernetic systems are rated in Marks, which provide bonuses on the same scale as the skill chart and the bonuses (not the ranks) stack; a clever player will therefore seek a breakpoint at around 10 for both where appropriate for optimal resource use. The game also includes a mental health problem from too much cyberwear; the Cybernetic Implant Rejection Syndrome, or CIRS, which reduces the character Empathy stat, resulting in uncontrollable psychosis if it ever falls below zero. The cybernetic systems described include a dazzling array of sensory, somatic, physiological, neurological and implementary systems. All told over 130 individual systems are described within these categories, and many have subversions as well. As can be expected there are more than a few interesting specific technologies in such a list; the capacity to transmit and receive tactile sensations over distance between individuals was one that became particularly useful in actual play, for example. Along with such interesting examples all the usual motifs from the genre can be found; Direct Neural Interfaces, Razornails, AI Cyberweapons etc. Computers also receive their own section with detail on processing power, operating system and applications and input/output devices. Computers are also measured in Mark #s, which each mark representing a "unit" of "CPU space" (read RAM), and ten times those units for storage. An example unit consist of some pretty weird examples, ranging from 1 hour of high fidelity audio (music) to 1000 pages of text. This suggest a range here of 1 unit of storage equating to either 10 megabytes per unit (text) to 60 megabytes per unit (music). Computers also have an overall speed based on processor core technology (silicon, "superchip", magnebubble - the PDP-11 is revived! - and "orgmolec"). The most powerful will take one round (10 seconds) to move one unit of data from storage to memory. Clearly the storage and processing values for a standard Mk 10 computer are well below contemporary standards, and even those a few years after publication of the book. Machine languages and programs also actually cost money. These criticisms aside the game does provide an interesting cyberspace environment complete with physical feedback counter programs against would-be netrunners being where they shouldn't be. The Cyberspace chapter provides some detail on the user environment, intrusion and combat programs, utilities etc., along with a fairly evocative description and game system steps for travelling through cyberspace and network components and design. Notably missing however, is various wireless technologies with the exception of satellite links. Other equipment is of the more mundane and recognisable kind; several different clothing options, hairstyles, body armour, tools and powercells, and a variety of weapons (including; "Rock. Yes, a rock. You throw it"), such as rocketguns, needlesguns, gauss guns, lasers for the more science fiction minded. In addition to these are smaller scale data devices ("most are between ... 10 to 100 meg RAM"), various personal accoutrements, physical security systems, medical equipment, and drugs both medicinal and recreational. Vehicles receive an abundant section of their very own, covering several examples for the civilian, commercial, military, and space sectors, along with weapons for the same. Those who perceived Cyberspace as merely a stripped-down version of Rolemaster/Spacemaster in an attempt to cash-in on the popular cyberpunk genre have missed out on an extremely good game. Whilst it is true that the game system is derived form the aforementioned games, the author managed to make the system much easier and thematically appropriate for the setting. The content-rich technologies that densely fill the pages of Cyberspace provide an enormous wealth of resources for player and GM alike, and the year-by-year history provides a very solid backstory. There are of course, some gaps. Despite arcologies and the wilds being listed as environs there was not even the most basic stats for wild (or artificial) animals. Fully-automated robotic systems could have received further development as well. And, as mentioned, the description for computational power is woefully inadequate. Despite these issues, Cyberspace is a very dense piece of work which oozes style. In conclusion it is also possible to give a one line review of all the supporting material; all the scenario and settings packs were great, and all supplements were terrible.